Builders and Contractors Trust (BCT) provides contractors with a Supplemental Unemployment Benefit (SUB) Plan. This Plan is treated as a fringe benefit for all hourly employees. BCT provides a powerful tool to help your business succeed by allowing you to profitably comply with prevailing wage laws, while providing your employees with a robust and accessible fringe benefits program which offers them income during periods of unemployment. BCT allows you to take the difference between the stated prevailing wages and your employees' total compensation packages and pay it to a SUB Plan instead of an additional hourly pay. Since the difference is treated as a fringe, it is not subject to labor burden - resulting in cost savings for your business. Your savings can allow you to bid more competitively on government construction contracts. 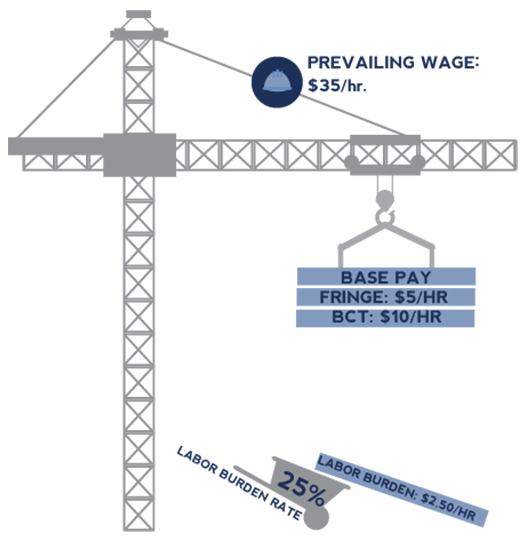 BUILDING A NEW WAY TO THINK ABOUT PREVAILING WAGE. Free yourself from the labor burden expense that comes with cash raises to meet prevailing wage work requirements. When the job requires a higher amount than you normally pay your employees, contributing to a BCT Plan can reduce your overhead, taxes, and expenses since it's treated as a fringe benefit deduction.